100% All Natural Wunder Hoof is a topical hoof care product that is absorbed quickly and easily into the skin, naturally stimulating hoof growth and improving the overall condition of the hoof. Natural fats and essential oils, including camphor and eucalyptus, make up the ingredients of Wunder Hoof. A particular combination of these ingredients makes up the secret formula of Wunder Hoof. Wunder Hoof’s pain relieving and anti-bacterial properties promote healing and improve soundness to hooves. 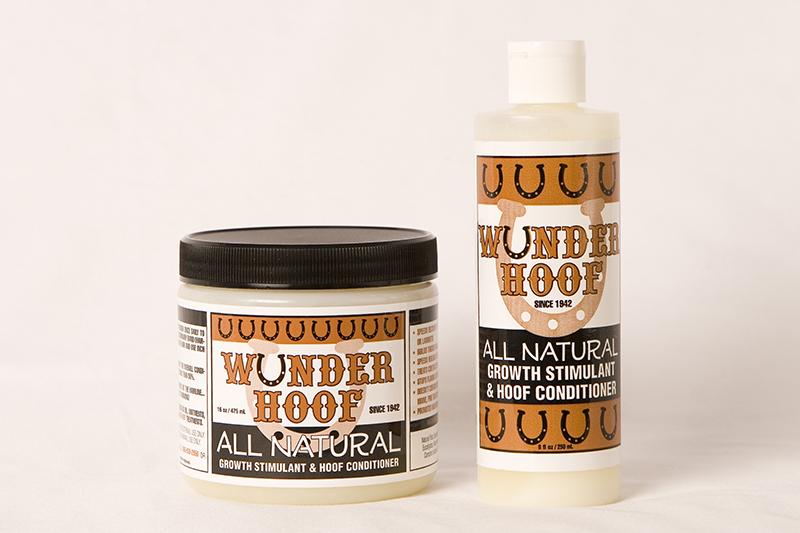 Wunder Hoof is free from irritating ingredients, non-caustic, non-toxic and biodegradable. Wunder Hoof is safe for humans; it may be applied by hand or with a stiff medicine brush. Not just for hooves, Wunder Hoof also aids in the treatment of saddle sores, scrapes, scabs, rope burns, relieves inflammations due to sore and arthritic joints and repels insects from treatment area. Our product is unique because it is made up of our secret recipe of natural ingredients, and is able to promote both hoof growth and conditioning all while being completely affordable.